The Catholic University College of Ghana (CUCG), Fiapre in conjunction with Pontifical Gregorian University in Rome organized a two months Certificate Course on the theme, “Safeguarding of Minors” from June 1 to July 31, 2016, under the Faculty of Religious Studies. The eight-week Programme aimed at the formation of persons involved in care-giving and proction of minors and practioners in child right related activities. The seminar, among others, included courses on: Culture and Childhood; Recognizing Signs of Abuse; Identifying Means of Interventions; Assisting and Caring for Victims/Survivors; and Developing Preventive Programmes. The programme which was facilitated by four (4) facilitators adopted the Seminar Method of interdisciplinary teaching comprising different disciplines such as Psychology, Methodology, Systematic Theology, Moral Theology, Pastoral Theology, Canon Law, and Social Sciences. Following a successful completion of the programme on July 29, 2016, a colourful graduation ceremony was organized on July 31, 2016 to award the participants a “Certificate in the Safeguarding of Minors”. The Certificate was jointly awarded by the Catholic University College of Ghana and the Institute of Psychology of the Pontifical Gregorian University. The graduation ceremony was preceded with the celebration of the Mass. In his sermon, Rev. Fr. (Dr.) Charles Bruno Kabir, OFMConv., admonished that we seek for an “Immortality Symbol” in-and-through Christ. The second part was the graduation itself. Some dignitaries and members present included the Vice Chancellor of CUCG (Prof. Daniel Kwabena Obeng-Ofori), Representative of the Centre for Child Protection (CCP) of the Gregorian University in Rome (Rev. Sr. Rejoice Mary Enyonam Hoedoafia, SOLT), Deputy Registrar of CUCG, Deans and Staff (teaching and non-teaching alike) of CUCG, the Graduands, and other invited guests. The Vice Chancellor in his speech said that “child protection is a critical yet delicate issue that requires skill and competency.” He said also that the interest of children could not wait and must be attended to with a high sense of urgency and commitment. He, however, urged the Government to critically take a look at the issue of unfettered access of the youth to the internet and the dangers it exposes them to. 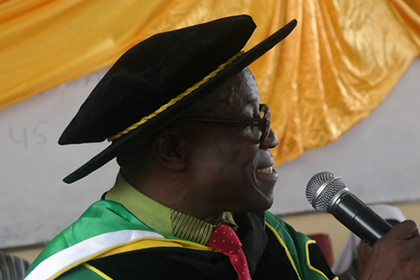 He again mentioned that the CUCG would continue to contribute its quota to the human resource development of Ghana. 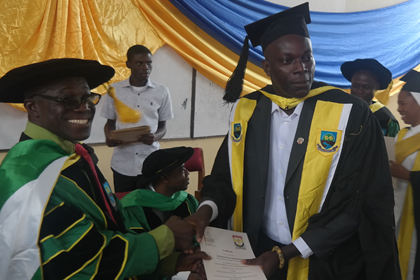 He, furthermore, encouraged graduates to “be alert, question behaviours, ask for help and refer children's issues as appropriate” Finally, he expressed his heartfelt gratitude to the Acting Dean of the Faculty of Religious Studies – Fr. (Dr.) Charles Bruno Kabir – and the facilitators for the good work done. He expressed the appreciation of the University also to the Representative of the CCP for making time to attend the function. In addition, a graduation speech was delivered by the representative of the CCP from the Gregorian University - Rome. She started by congratulating the pioneers (first graduates – thirteen  in number) of the Programme in Ghana. 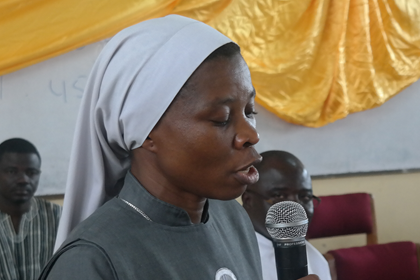 She also expressed her gratitude to the CUCG for their collaboration with the Gregorian University to make the maiden CCP Programme in Ghana a reality. She pointed out that the Programme is developed in such a way that it could be beneficial to both the academia and practitioners because of the practical skills imparted. She, furthermore, expressed the hope that “efforts should be made to break the culture of silence and on children's rights enhance protective factors.” She also wished to foresee “the years ahead to be characterized by deep compassion, empathy and a willingness to raise awareness, to take risks, to speak up, to reach out to victims and survivors of abuse in our society and especially in the Catholic Church.” She concluded by admonishing all and sundry to be true witnesses of the Gospel values and be truthful in all their dealings with one another. 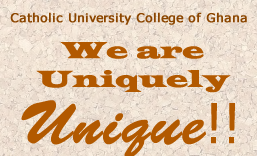 In a nutshell, owing to the significance of the Programme, the Vice Chancellor mentioned that it is the plan of the CUCG “to develop the Programme into a Diploma programme and ultimately into a Degree programme.” Therefore, all and sundry were called upon to enroll and continue to upgrade themselves when the CUCG comes out with these programmes.